MEF, working in conjunction with leading standards and technology developers today, realizes that no one network technology domain is sufficient to be thoroughly prepared. Working together with leading subject matter experts, and creating a framework that is flexible and collaborative, they are building a certification architecture for standards-based, vendor-neutral networking skills. The ProCERT Framework consists of levels of education and achievement. The starting point is the "Essential" level, which is a foundation of learning and achievement in our series of certifications. The MEF Network Foundations (MEF-NF) exam is a vendor-neutral, concept level introduction to the world of software-driven modern networking, including a detailed introduction to SD-WAN. It's a great place to start. "Professional" is a deep-dive practitioner-level of exams focused to specific domains of knowledge. These include Carrier Ethernet, available currently in the MEF-CECP exam, SDN-NFV, available currently in the MEF-SDN/NFV exam, LSO/Network Automation and Network Security, both in development to be released in 2018 and early 2019 respectively. More exams to be introduced in the near future. The MEF has set a new level of industry achievement by acknowledging all those who have achieved at least three certifications and in good standing automatically become a "NETWORK EXPERT". If you don't know where to start, begin with MEF-NF today, move on to showcase your Carrier Ethernet skills with the MEF-CECP credential, then prove yourself a significant asset with the MEF-SDN/NFV credential. Having these three under your belt will then define you as a NETWORK EXPERT, a unique credential to have in a competitive marketplace. Exams include MEF Network Foundations, the vendor-neutral, concept level introduction to the world of software-driven modern networking, including a detailed introduction to SD-WAN. A great place to start! Deeper dive, rigorous, practitioner level exams in domains of Carrier Ethernet (available now), SDN/NFV (available now), LSO/Network Automation (Q4 of 2018), and Network Security (Q2 2019). Each exam validates knowledge, skills and abilities in the key technology domains of today’s networks. 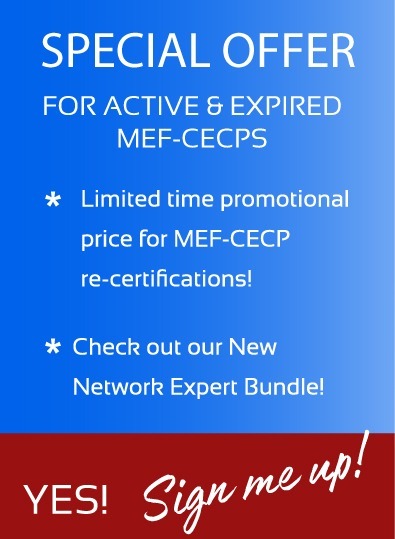 Those IT professionals who pass three ProCert framework exams earn the coveted MEF NETWORK EXPERT credential. No extra exam required, but this credential attests to a broad and comprehensive knowledge and skills in modern network technologies.